Can you hold a convention on an Aircraft Carrier. Sure the space is mostly there, but as an old doctor once said, “She’s a warship, not a luxury liner” (ok, that wasn’t Dr. McCoy’s actual quote). Well the Officers and Crew of the KrakenCon decided to try it out anyways. 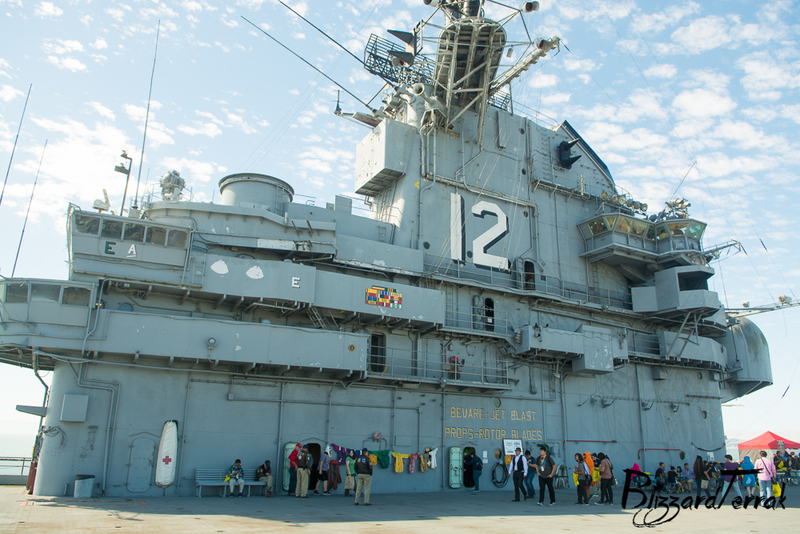 For their Fall 2015 event, we all reported to our muster stations on the museum ship U.S.S. Hornet (CV-12). The first thing you realize is what an undertaking this must have been. 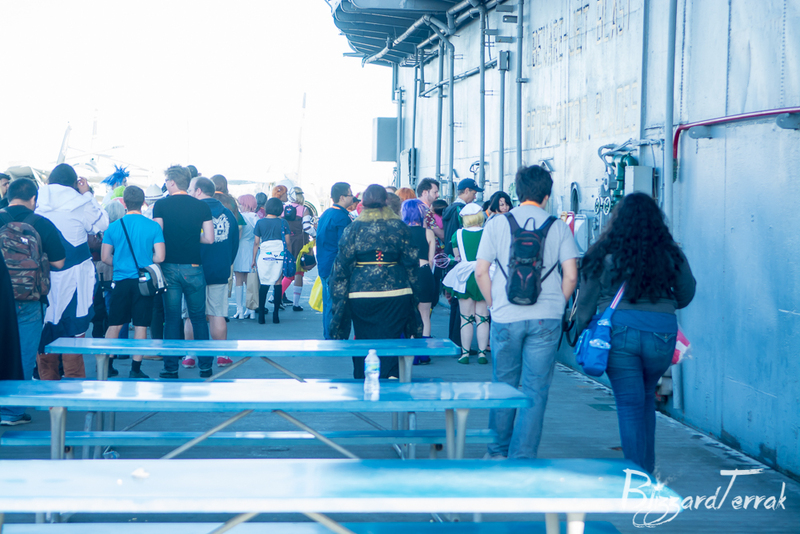 Located on the far end of the old, abandoned Naval Air Station Alameda, the organizers tried their best to arrange for a shuttle bus from the Oakland Convention Center (their previous location, near the 12th Street BART Station) and to have as much parking as they could. The organizers had a few food trucks and food stands set up on the dock and the hanger deck. Most of the what used to be the “Exhibit Hall” were held on the main hangar deck, with a few of the smaller panels held in the Petty Officer’s Mess (also called the CPO Mess). 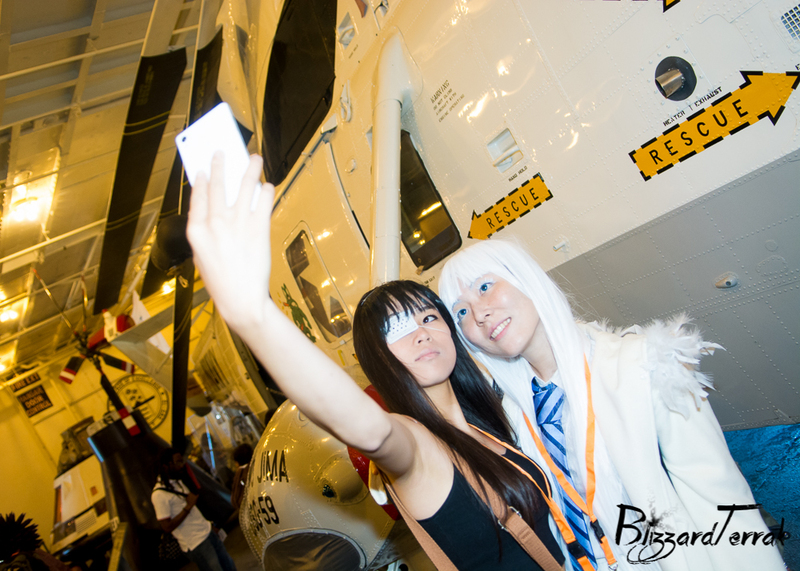 The main stage and cosplay gathering areas were all on the flight deck. I could write a whole history lesson on Essex-class carriers like the USS Hornet and how it felt to be on such a historic ship, but I’ll save that for another write-up (if anyone is interested, comment or message me). Getting around the ship (not boat) wasn’t easy since it was not meant for cosplayers (or photographers) to move around, putting restrictions on less mobile cosplays and photography gear. Still, if the cosplayers managed, so did the photographers. Assuming you managed to shuttle or park close, the first challenge is the gangway, where the subtle movements of the ship compared to the dock were felt. Assuming you managed to get across and grow some minor sea legs (I don’t remember any reports of motion sickness on board, which surprised many), the hangar deck was crowded. Part of it was sectioned off so that regular guests to the museum ship could still come aboard with the aft (rear) section gated off for the Artist Alley, Photo booth (hosted again by OscarC Photography) as well as access to the CPO Mess down so very narrow “stairs” (they were more like ladders with chains on the side). Of course, the “best” is yet to come with the access to the flight deck. There were only two paths to the Flight Deck, so one was designated “entrance” and “exit”. The entrance was where the pilots used to use, hence an older escalator. However, the museum’s volunteer staff only turn it on for handicapped individuals, so the rest of us, cosplayers and photographers included, had to walk the entire flight up. It was worth it though as the weather was nice and there were several planes on deck. Going down was just like going to the CPO’s mess, except longer and somehow more narrow so I had to make sure I “hit the head” (used the bathroom) on the hanger deck before I climbed up. During the day, the volunteers continued to give tours to the superstructure / island (most of you will think of it as either the “bridge” or “tower”, which were very cool to attend if you weren’t afraid of even more ladders. Moving around was definitely a challenge, which is why I have to marvel at how cosplayers, or better yet, the older volunteers did it. Many of us attendees were huffing and puffing while the older volunteers just grinned. I think I had my weekend gym requirements attending. As usual, the convention staffers managed to keep this challenging location in check for the events they had planned. Some were going to suffer some sunburns and some will cry out for more personal space, but it’s honestly too be expected. Events were only slightly delayed and due to the museum hours, the con only went from 10 AM to 6 PM, probably the shortest I’ve ever experience. At the end of our tour of duty, I can say that “ship and crew performed admirably”. 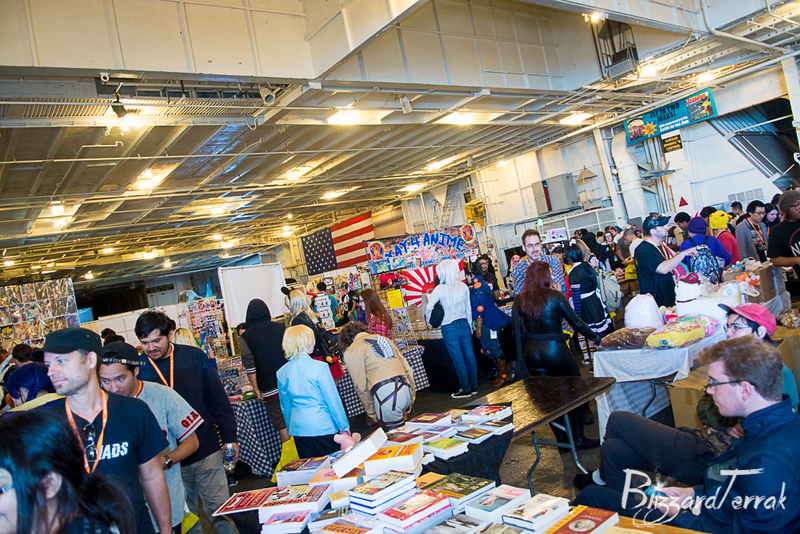 Would I recommend anime or comic conventions always be held on carriers? No. I think eventually the novelty would wear off for both the real sailors and those of use dressing to be one. It’s a unique event that gives this convention its charm and I would hate to see it fade. Would I go to this event (or similar events) again? Yes. It’s too unique to pass up (and as a fan of Star Trek, how could I?). Definitely going to be one of my highlights in an otherwise mediocre convention year. – Location challenges for mobility, food, ATMs, and certain limits such as bag sizes. ~ by BlizzardTerrak on October 12, 2015.